Many years ago, our Sunday School teacher said something while elaborating on a particular lesson. She said we should endeavour to come to church even when we don’t feel like it because seeing us would make somebody’s day. That didn’t sound very spiritual. It may not rank as one of the top ten reasons to be in church. But she was making a point, that point being that whether we knew it or not, some people cared very much about us and always longed to see us. She said these people may not be among those we count our friends but God uses our very presence to lighten their day and encourage them. Maybe, you haven’t had a Sunday School teacher like mine: a woman of deep insight. But I want to tell you the same thing she told us that day. YOU ARE LOVED! Very much so! God loves you. He has demonstrated it by sending Jesus to reconcile you to Him (Romans 5:8). But, perhaps, you can preach many more sermons on that than I can. I want you to also know that a lot of people love you, some you know of and some you don’t know. It’s all connected really because those people who love you in a wholesome manner have had that love planted in their hearts by God. So ultimately, it’s God who is loving you through them. Over the years, I’ve seen the veracity of that Sunday School teacher’s assertion in my conversations with beloved brethren even in other churches I’ve attended since then. People want to know how I’m doing, they are excited when I look good (so I take a little more care on personal grooming than I would have otherwise) and someone once told me they didn’t know what transpired during one service because I wasn’t there. That is how worried they were! (Mind you, I wasn’t a minister, just part of the congregation quietly soaking in the atmosphere). I’m not being vain in sharing this. I know it’s not peculiar to me. But perhaps, people have not been bold enough to tell you how much they care about you. Do not presume as a result that you’re not loved. Even if you’ve been treated badly by some, it’s not the entirety of how people see you. There are those who love your smile, who make a point to say “Hello,” who love to hear you talk, who wish you well in their hearts and pray for answers to your problems. And I’m not just talking about family members and close friends. So even if you have none of those, do not think it means no one truly cares for you. God does and because of that, He places people in your path to demonstrate His love for you in different ways, some big, some small. Appreciate and be grateful for it all. Take none of it for granted. And return all the glory to God. I was single until recently and because I had this revelation I’m sharing, I never felt forsaken. In fact, someone once asked me whether I ever stopped to think about my life. He wasn’t the only one thinking that way. Why? Because it baffled them that I could be so happy and content while being single for decades. If you have a spouse, praise God! If you don’t, praise God too! God does not love the single less than the married. Jesus our Messiah, Paul the apostle, Jeremiah and Daniel, the prophets, were all single. In fact, God often goes to great lengths to show the single who are in Him how very special they are, so that they will not be unduely weighed down by sorrow. I remember Valentine’s Days during my singlehood when people I least expected celebrated me. On one occasion that left me stunned, my late brother’s wife visited and brought me some expensive gifts. By her status, that wasn’t supposed to happen. The problem we have is that we have so pigeonholed love that we don’t often recognise it. It comes in many ways, some subtle, some bold and loud. Some of it will be confessed to you, some will not but it’s all there in the circle of life. Let no one tell you you’re not loved. You are. I will say it again for emphasis: God loves you and so do many others, some of whom you don’t know. So, lift up your chin, breathe in and let out a shout of praise ’cause YOU ARE LOVED! YOU ARE SO LOVED!!! Halleluyah! Bless you, Flawlex, and have a beautiful day! Hi Thank God! Many people are a little shy or they fear rejection. That may be why they don't easily express their feelings. You can just start by saying "Hello" or paying them a simple compliment. See how they react and take it from there. But the subject of my post is different. We need an assurance that we are loved. With it, we won't feel so morose or incapable of facing life with vigour. You are blessed! Thank you too, JC! Have a beautiful end of year in Jesus' name. Your post really lifted my spirits today. Thank you Edith. I can understand folk looking out for you in many settings. I know I would. Your faith, warmth & kindness come across in all your writing. So glad to hear from you, Penny! Like I said, this isn't peculiar to me. I know I long to see some people too and I believe, there are those like me who are happy and eager to make contact with you. Everyone of us in Christ is a blessing to some others. That's the way God designed things to be (Romans 12). I trust you are doing fine. Stay ever blessed in Jesus' name. Amen. Strength, grace and peace to you, my dear! ?✌?? You are such an encouragement! Thanks for that! May God continue to bless your work. Yes, He does! Have a blissful December in Jesus' name. 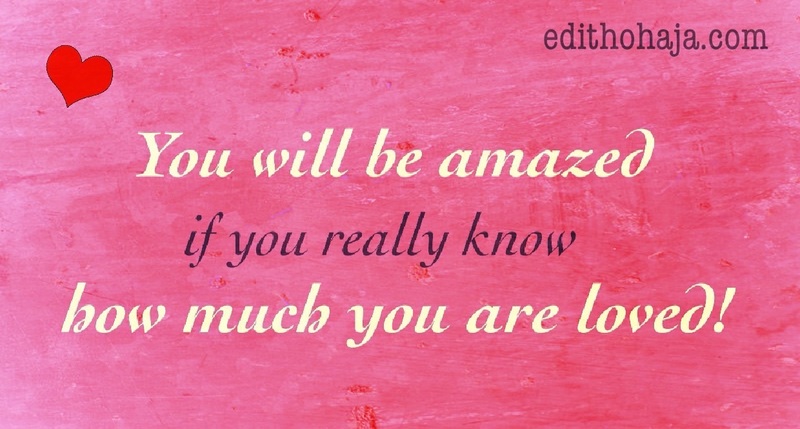 Edith, what a profoundly beautiful post! Your insights are so uplifting. I am going to save this post to read when I'm feeling downhearted and/or unappreciated! God bless you. Glory to God! I really appreciate this, Gloria! It's a big encouragement to me. I pray multiplied blessings on you, your family and ministry in Jesus' name. Makes me conscious of God's love for me and propels me to love others as well. Thank God for that! You are favoured, Nedu, in Jesus' name. Thank you, thank you, thank you so much for reminding me how much my Lord Jesus does love me. He put you in my life sister. I praise, thank, and give my Lord ALL THE GLORY!!! I just became single, a two year relationship ended on the 3rd of December. Don't get me wrong, I know how much my Lord loves me. I truly, with my whole heart, mind, body and spirit want only a relationship with Him. I am learning that when you put the world before our Lord Jesus, it starts to not feel right within yourself and a change HAS TO BE MADE. My Lord asked me, "what is your choice?" Always and forever it will be my Lord Jesus. Even if we think a relationship is right, our Lord will let us know what His plan is for us, if we choose to listen. Single people need to remember, they are not single at all. I have the best Father, Husband, and Friend any one could have. For you see sister, I am not of this world, I AM OF MY FATHERS!!! I asked my Lord Jesus for DIVINE CELIBACY. I am happy with the choice I have made. Thank you and I am sure others will thank you as well for the ministry and love you give every day. I know I have been blessed with you. A very awesome spiritual present from my Father in Heaven. Thank you so much, Roberta! I'm so glad the post spoke to you. The Lord wants to be intimately involved in our lives if we let Him and He will bring the right people to us at the right time. I really appreciate all your kind words and encouragement. I pray that we will continue to mutually edify each other as we journey along in Jesus' name. Love you loads! ??❤️? Thank you too and remain blessed in Jesus' name. Sometimes, we think love has forsaken us, but the truth is that the fact that we are alive is because of love. God's love for us knows no bounds and He loves us without asking for payment. i am indeed so loved. Yes, you are, and so am I! Sometimes it is those who we hardly notice who take notice of us. Yes, it's often like that. Thanks for this post ma. your words heal the hearts of many. you are a blessing to our generation. I give God the praise for using you to bless our lives. Awwww! Such lovely things to say! Thank you for the encouragement from your kind words. I return all the glory to God. After reading this piece, I know that I am loved and it has now stuck to my heart. Many young people feel that nobody loves or cares for them unknown to them that love himself is in love with them and he showed this by giving his son to us, this is recorded as the highest display of love, this piece has spoken to me and has filled me. Very interesting and motivating, Thank u Ma for making me to realize the fact that someone cares and loves me, even if they don't show it. It was for love that God sent his son to die. It was was for love still that Jesus did not spurn the offer to die on the cross. Love is the greatest of all commands. We must learn to show love to others if we must be loved by others. And we must realize how very loved we are. Shalom! Awwww, that's really nice! Thank you too and be richly blessed in Jesus' name. My prayer is that the Lord will ascend me to my throne of glory in Jesus name Amen. Oh dear! This is what happens when people read posts today and comment tomorrow. Aunty you are really gifted at this I must say that your words always touch a part of me, this one did in many ways and am feeling loved now. Thank you so much. Glory to God and thank you, Ifechukwude! I am loved by God! Yes, you are, and by others too! I like the part where u said that love is not determined by marital status. it means one can still be loved with or without boyfriend or husband. thank u ma for your tireless contributions to my life. Glory to God, Chinasa! Married or not, we are all special to God and many people, some of who we may not know. Praise God! He is responsible for it all. Amen and thank you for this!! Sometimes we forget that we actually have such a positive impact on those around us! Bless you, Diane! Some people think it's pride to acknowledge these things but I think it's false modesty to deny them. The important thing is that we don't become conceited but see ourselves as God sees us so that we can function effectively in the roles He has given us. Thanks for the visit. Bless you too, my dear! This touched me and im going to share it with my cousin who sometimes says, "no one likes me" I remember telling her that even if you feel you don't have any friends, God is always there. Awww, I'm happy you love the post and I pray it blesses your cousin richly. Thank you Ma this wonderful piece. Most times we want validation from people in order to know they care and when it doesn't come forth, we feel lonely. But the truth is, we already have the greatest love of our Heavenly Father, who cares about us and honestly, it's the best out there. Very encouraging. Good to know we shouldn't let anything or anybody dictate who we are. Even if nobody cares for us, God does. What a motivational story. We must learn how to love others as God loves us. At times due to our current situation, we think that God's love has left us, but the fact that we are still alive and strong is a good reason to thank God and believe that truly, HE loves us. Lovely post ?? God Bless ? Wow, I'm delighted to have you here, Katya! You are soooo blessed! Delighted to hear from you, Angela! Praise God for the post. I pray it blesses the readers of the Silver Lining page. May God continue to bountifully bless you, your beautiful family and your work for His kingdom in Jesus' name. We live in a society that only see the married as the only 'successful' people without considering that a lot of married ones are miserable. People should always live happily whether single or married. We all should always feel loved despite our status. this goes a long way in showing how much we matter to each other. Whether at church or wherever, we are loved. Nice one ma. This is one of the areas we believers seem not to consider most times. i personally have experienced it even in my own denomination. Bless you Aunty Edith for this wonderful piece. God's love for us supersedes any other love anyone can show us, because his love for us is unconditional. So if you're single, it's still okay, God would give you yours in due time. MUM YOU ARE RIGHT,LOVE COMES IN DIFFERENT IN DIFFERENT DIMENSION,LOVE IS AN AIR YOU FEEL YOU EITHER THROUGH CHISRT OR PEOPLE AROUND YOU. I am so loved by God,i actually think he loves me more... He always care about our welfare,he loves us nd wants us to draw nearer to him....his love is matchless,geninue,defined,his love is agape. God's love for us is awesome and abundant despite the fact that we are constantly erring he still open his arms and embrace us ! He love is too much ! God's love for us is so marvelous whether you're single or not. Our marital status should not dictate how people loves us, but rather God demonstrates how he loves us by the people around us. We ought to love God too by obeying his commandments which centers on love and he will fulfill his promise as found in the biblical book of the Proverbs, .. For the LORD reproves him whom he loves, as a father the son in whom he delights. (Proverbs 3:12) God bless you abundantly Mum.